Macquarie Centre at North Ryde, Sydney. The project is part of AMP Capital Shopping Centres' $2.8 billion development pipeline, which includes major redevelopments underway at Pacific Fair on the Gold Coast and Perth's Ocean Keys, and proposed at Garden City, Booragoon and Karrinyup shopping centres also in Perth. AMP Capital Shopping Centres Managing Director Bryan Hynes said the development transforms Macquarie Centre's retail offering and customer experience and provides a compelling opportunity for investors. "The redevelopment of Macquarie Centre responds to the strong growth in the Ryde region. With a total trade area of 337,770 people, expected to unleash $6 billion in retail spending by 2021, the north-west corridor is considered the new capital of household wealth in Sydney and by the end of the year the area will have a new-look shopping centre to match," Mr Hynes said. Stage one includes a Fresh Food Market precinct featuring new Coles and ALDI supermarkets alongside a refurbished Woolworths. The centre features an innovative 21-metre curved iconic digital panel, which delivers both ambient content and advertising. Spinifex Group, creative specialists behind the Sydney Vivid Festival, the panel is part of AMP Capital Shopping Centres' focus on creating unique places and experiences for shoppers. The second stage of the project will be completed at the end of the year and will provide one of the finest retail and leisure destinations tailored to residents and the expanding Macquarie University and Macquarie Business Park. 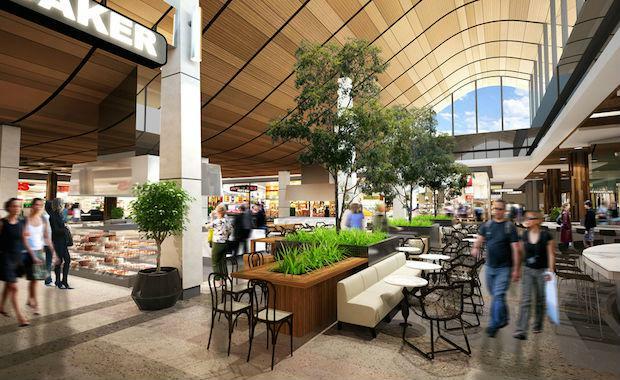 The centre will become the largest suburban shopping centre in Sydney upon completion, growing around 38,000 square metres to be approximately 138,500 square metres in size. Once complete, Macquarie Centre will house Australian and international designers and a two-level David Jones.